Calling herself "the housewife of the senate," Helen Ring Robinson was Colorado's first female state senator and only the second in the United States. Serving from 1913 to 1917, she worked for social and economic justice as a champion of women, children, and workers' rights and education during a tumultuous time in the country's history. Her commitment to these causes did not end in the senate; she continued to labor first for world peace and then for the American war effort after her term ended. 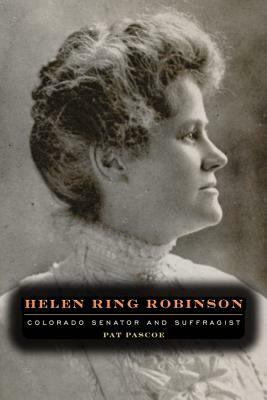 Helen Ring Robinson is the first book to focus on this important figure in the women's suffrage movement and the 1913, 1914, and 1915 sessions of the Colorado General Assembly. Author Pat Pascoe, herself a former Colorado senator, uses newspapers, legislative materials, Robinson's published writings, and her own expertise as a legislator to craft the only biography of this contradictory and little-known woman. Robinson had complex politics as a suffragist, peace activist, international activist, and strong supporter of the war effort in World War I and a curious personal life with an often long-distance marriage to lawyer Ewing Robinson, yet close relationship with her stepdaughter, Alycon. Pascoe explores both of these worlds, although much of that personal life remains a mystery. This fascinating story will be a worthwhile read to anyone interested in Colorado history, women's history, labor history, or politics. A professional writer and former teacher, Pat Pascoe served twelve years in the Colorado State Senate, where she focused on education policy. More information about Pat and her career can be found at her website. "The mysteries surrounding this pioneering woman make this timely biography a compelling read. Congratulations to author Pat Pascoe! We will all be enriched by getting to know Helen Ring Robinson and by gaining further insights into the time in which she lived." "For nearly a century, Helen Ring Robinson has rested in peaceful anonymity. Pat Pascoe's exhaustive research has changed all that. Robinson can now take her proper historical place as Colorado's first elected state senator and pioneer crusader for the rights of women and children. Pat Pascoe's detailed narrative provides, with clarity, a fascinating picture of Colorado politics in the first quarter of the 20th century." "Helen Ring Robinson left an amazing legislative record of achievement for women and children during a time when Colorado politics were as turbulent as any in recent recollection. Send this book to your congressional representative. They could learn a lot from this woman who served 100 years ago!" "This careful documentation on the little-known and gutsy achievements of the second woman in the world to serve as an elected state senator, dedicated to bettering lives of women and children, should be in every Colorado high school and college library so that current and future students may know what women have accomplished here. Pat Pascoe has produced a very readable work with many personal insights, exemplifying the tradition that past women are role models for future generations."